Wise words: Pope Francis says Christians should boast only about being a sinner and being saved by Jesus Christ. POPE Francis said Christians should boast about only two things: that they are sinners and they have been saved by Jesus Christ. It’s useless to brag about formal education and degrees because they did not have the power to transform people into credible Christian witnesses, the Pope said; only a personal experience of God’s saving grace can do that. 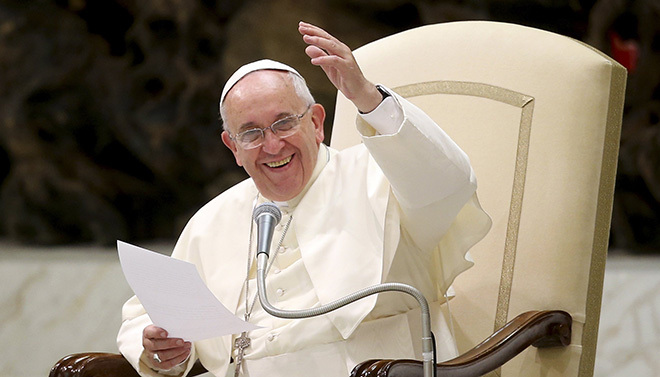 In his homily on September 4, Pope Francis focused on the day’s readings. In the first, St Paul warns about the vanity of those who are “wise” and how “the wisdom of this world is foolishness in the eyes of God” (1 Corinthians 3:18-23). The Gospel reading tells of Simon Peter, the fisherman, who begged Jesus to “depart from me, Lord, for I am a sinful man” (Luke 5:1-11). “Paul tells us that the power of the Word of God, the thing that transforms the heart, that changes the world, that gives us hope, that gives us life, doesn’t lie in human wisdom: It isn’t in speaking eloquently and in a beautiful discourse with human intelligence,” the Pope said during an early-morning Mass in the chapel of his residence, the Domus Sanctae Marthae. “The power of the word of God comes from the heart of the preacher” transformed by an encounter with Christ, the Pope said, according to Vatican Radio. The only way to be transformed, he said, was by recognising one’s sins before God. “It is that encounter between my sins and the blood of Christ that saves me,” he said. That’s why Paul never boasted of his studies, the Pope said; the apostle only boasted of his weaknesses and sins, and of the cross of the Lord. Peter, too, immediately recognised his sins after he encountered Jesus during a miraculous catch of fish. By seeing his own sins, Peter experienced the power of Christ, the Pope said. “If a Christian isn’t able to feel he’s a sinner and saved by the blood of Christ – this crucifix – he is a Christian who’s gone just halfway, a lukewarm Christian,” he said. “And when we find churches in decline, parishes, institutions in decline, well, it’s certain the Christians there never encountered Jesus Christ or have forgotten about that encounter. “The strength of Christian life and the power of the Word of God lie exactly in that moment where I, a sinner, encounter Jesus Christ and that encounter turns my life upside-down, changes my life. And it gives you the strength to proclaim this salvation to others,” the Pope said. The Pope ended his homily asking people to reflect on their ability to see themselves as sinners, “not in theory”, but by confessing “the concrete sin”, and to think about whether they really believed in Christ’s ability to redeem those sins and “give me a new life”.